Split plate/extra plate charge for any sandwich, wrap or mac $1.95. Wonton wrapped hot pepper cheese, peppered bacon and jalapeños. Served with ranch. AS SEEN ON TV! Homemade tortilla chips topped with Joe Mama's Signature Mac N Cheese, bacon, tomatoes, jalapenos and cilantro. Homemade tortilla chips loaded with your choice of beef or chicken, topped with Joe Mama’s Signature Nacho Cheese Sauce, salsa, sour cream, guacamole, lettuce, tomatoes, black olives, jalapeños and cilantro. Beer-battered chicken breast fried to perfection. Served with your choices of sauce. Wonton wrapped slow-roasted corned beef, Bavarian sauerkraut and Swiss cheese. Served with a side of 1000 island dressing. 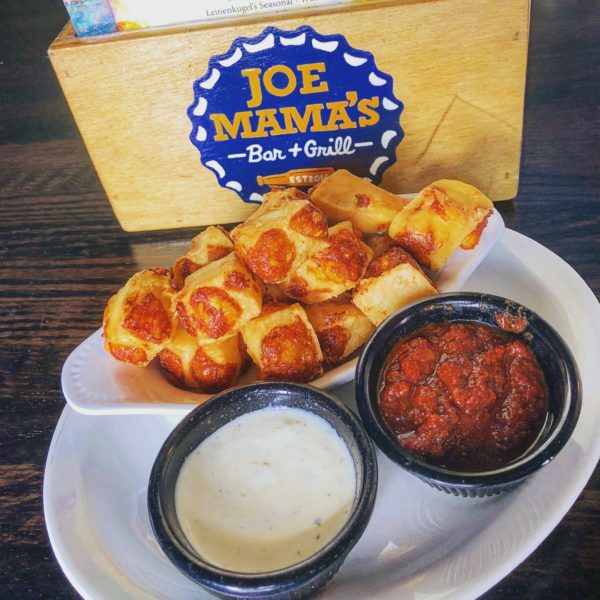 Little pillows of cheesy heaven from Chippewa Falls, Wisconsin. Served with ranch and marinara sauce. Shredded onions lightly dusted in seasoned flour and fried crispy. Served with homemade remoulade. Wonton wrapped mozzarella cheese served with marinara sauce. Served on a bed of greens and topped with wonton strips. Our famous Mac N Cheese rolled in panko and fried to golden perfection, served with ranch. Savor the flavor! Hand cut portobella shrooms lightly beer battered and deep fried, served with homemade ranch. Fried crispy and served with your choice of 2 sauces per order. Celery and carrots available upon request. 1/2 lb Black Angus burger topped with Joe Mama’s signature Mac n Cheese and Applewood smoked bacon. Thinly sliced, slow-roasted beef with melted mozzarella, sautéed shrooms, sautéed onions, lettuce, tomato and horsey sauce. Grilled or crispy chicken tossed in Bang Bang Sauce, with mixed greens, tomatoes and crispy wontons. EXTRA Applewood smoked bacon, lettuce, tomato and mayo on a toasted hoagie. Thick-cut slow-roasted corned beef, Bavarian sauerkraut and Swiss cheese on marbled rye. Served with 1000 island on the side. 6oz USDA Choice Tenderloin grilled to perfection topped with melted Swiss cheese, sautéed shrooms and onions. Served on a pretzel bun with a side of au jus. 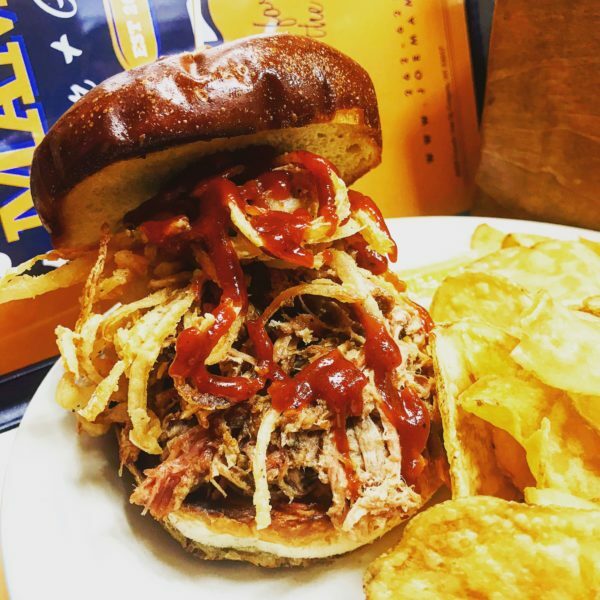 Slow roasted pulled pork topped with haystack onion rings and finished with BBQ sauce on a grilled pretzel bun. Grilled or crispy chicken, Applewood smoked bacon, lettuce, tomato and shredded cheddar with your choice of Ranch or Buffalo style. 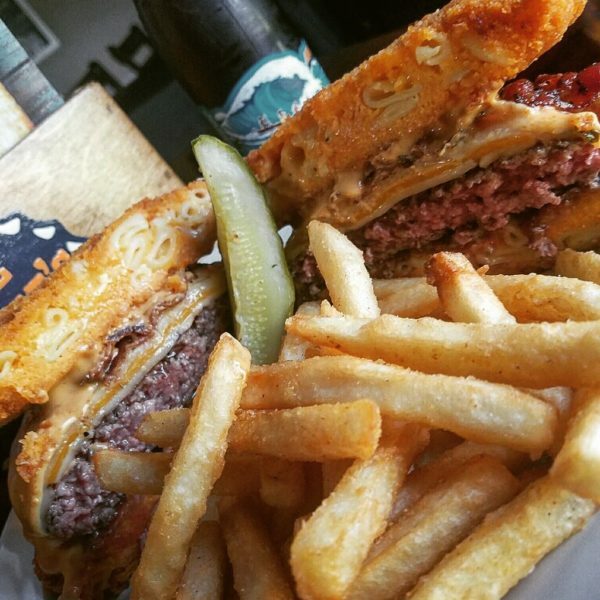 1/2 lb black Angus burger topped with American, cheddar, pepper jack and nacho cheeses, Applewood smoked bacon and served on a handmade crispy mac & cheese bun. Thinly sliced, slow-roasted beef and mozzarella cheese resting on a grilled hoagie. Served with au jus and horsey sauce. AS SEEN ON TV! 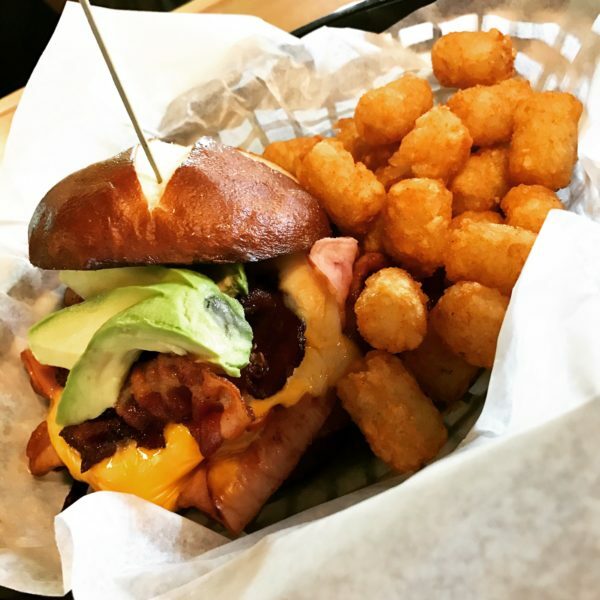 1/2 lb black Angus burger topped with American, cheddar and Swiss cheese, Applewood smoked bacon, grilled ham with a sunny side up egg and crowned with Lake Five Cheese Curds.Served on a pretzel bun. 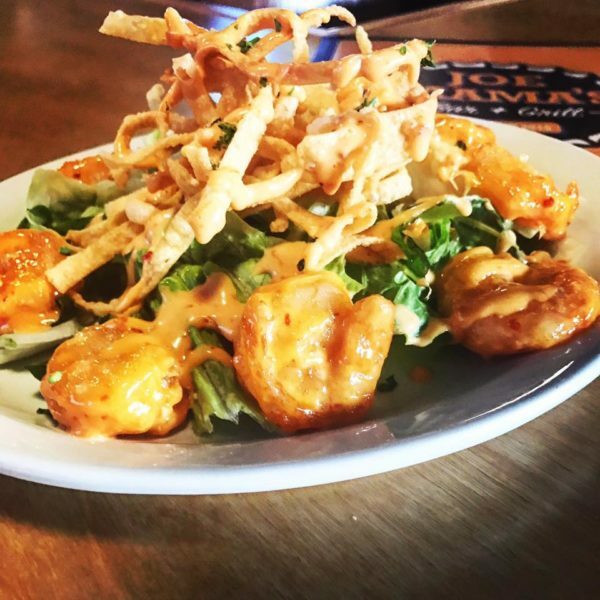 Add any of the following: Chicken $3.95 | Tenderloin $6.95 | Grilled Shrimp $4.95 | Choice of dressings: Ranch, Blue Cheese, 1000 Island, Caesar, Honey Mustard, French, Low Fat Balsamic or Low Fat Raspberry Vinaigrette. 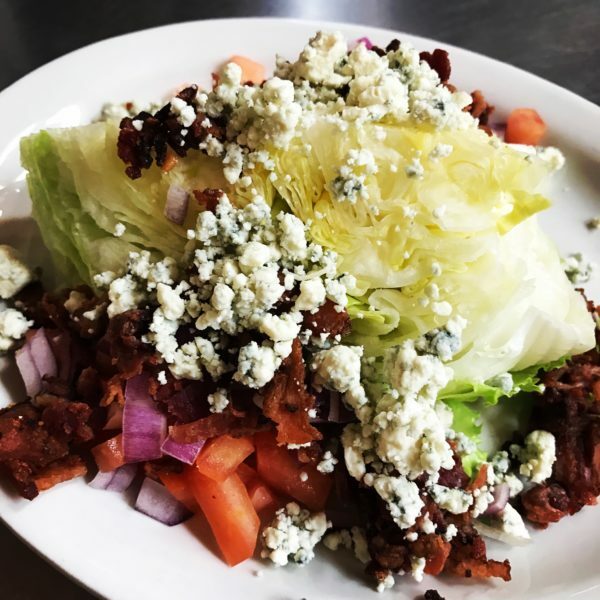 Crisp wedge of iceberg lettuce, Applewood smoked bacon, tomatoes, red onion, bleu cheese crumbles, croutons and your choice of dressing. Romaine hearts, tomatoes, black olives, shaved parmesan, croutons and Caesar dressing. 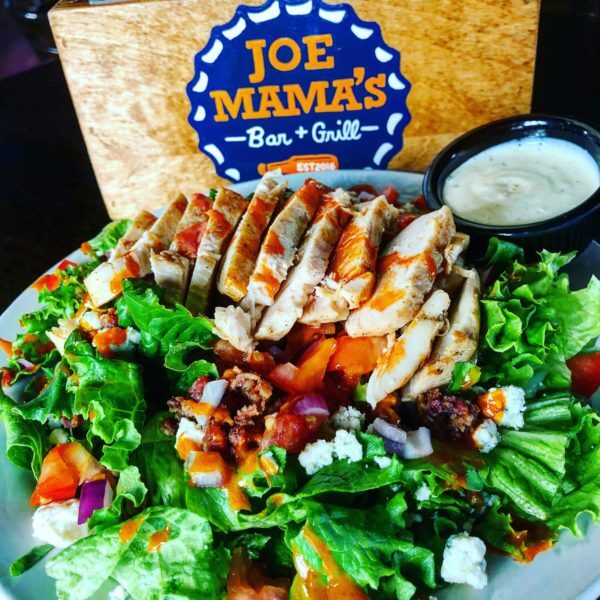 Mixed greens, chopped romaine, crispy Aplewood smoked bacon, tomatoes, red onions, blue cheese crumbles, chopped celery & carrots and croutons. 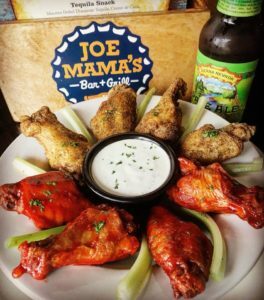 Served with buffalo sauce and your choice of dressing. Applewood smoked bacon, cheddar cheese, hardboiled egg, avocado, tomato, red onion, cucumbers and croutons with a blend of romaine and spring mix. Served with your choice of dressing. Made with American, cheddar, cheddar jack, parmesan, pecorino romano. Served under a toasted breadcrumb topping. Crispy chicken tossed in buffalo sauce, with bacon & blue cheese. 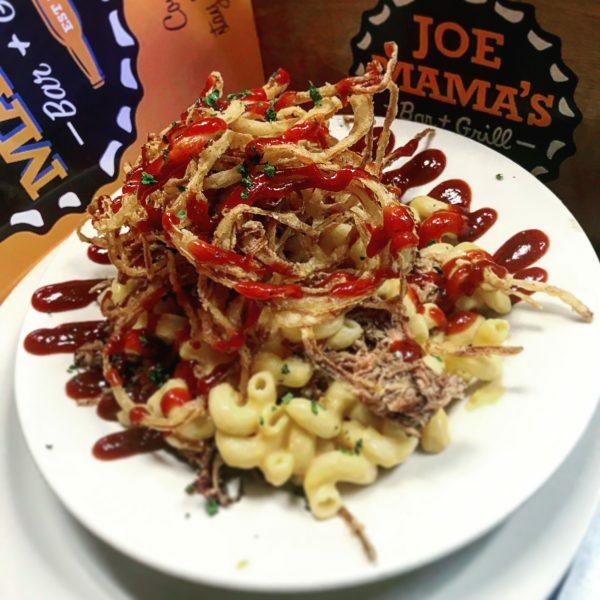 Slow roasted pork, haystack onion rings & topped with BBQ sauce. Stop in and ask your server what we have up our sleeve today. 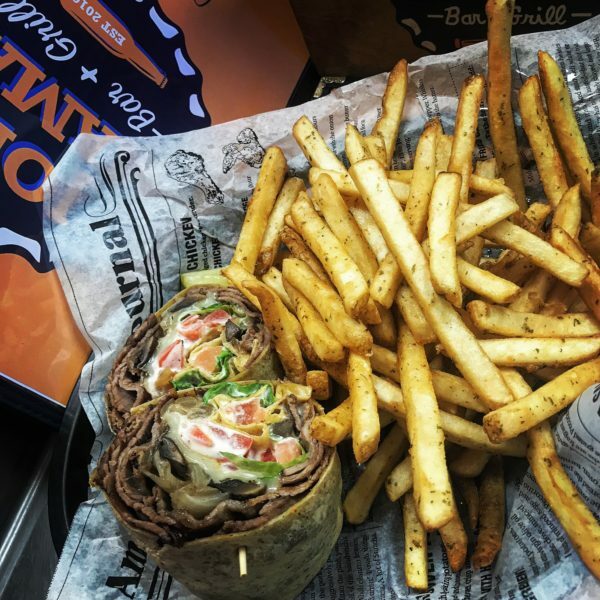 All sandwiches and wraps are served with a pickle and homemade chips. Gluten free buns available $1.00 extra. Upgrade tater tots $1.95 | battered french fries $1.95 | haystacks $2.50 | side salad $2.50. Split plate/extra plate charge for any sandwich, wrap or mac $2.95. Topped with your choice of American, cheddar, Swiss, pepper jack, hot pepper cheese, mozzarella or bleu cheese. Mozzarella cheese, Applewood smoked bacon, avocado, lettuce and tomato. Pepper jack & cheddar cheese, Applewood smoked bacon, grilled ham, topped with haystack onion rings. Served with lettuce, tomato and BBQ sauce on the side. Cheddar cheese, avocado, lettuce, tomato and crispy wontons. Finished with a drizzle of Bang-Bang sauce. Hot pepper cheese, peppered bacon and jalapeños. Served with lettuce, tomato and a side of hot sauce. Topped with sautéed shrooms, melted Swiss cheese and a dash of white truffle oil. Served with lettuce and tomato. Pepperoni, sausage, Applewood smoked bacon, Canadian bacon, hamburger, chicken, mushroom, onion, tomato, green pepper, pineapple, black olives, pepperoncini, jalapenos, green olives. 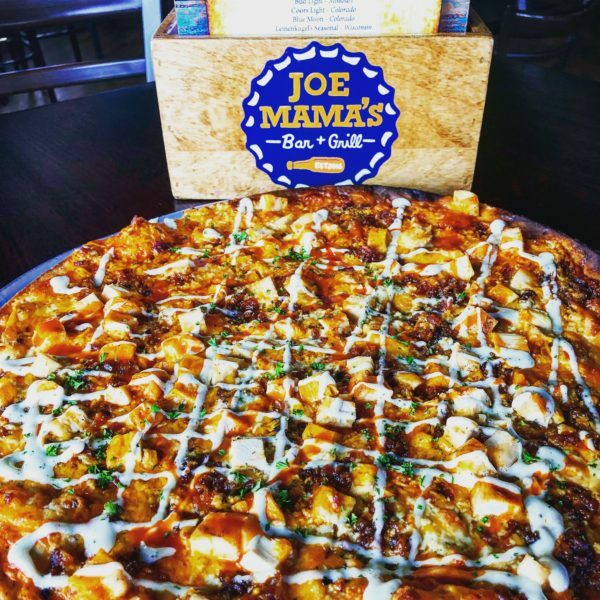 Your choice of grilled chicken or pulled pork, BBQ sauce, mozzarella and cheddar Jack cheeses, red onions and cilantro. Finished with a drizzle of Bacon BBQ sauce. 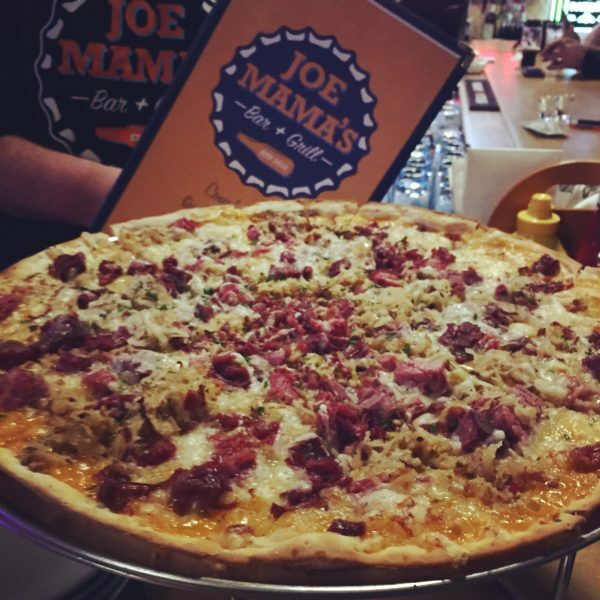 Loaded with all the meats…shaved prime rib, sausage, pepperoni, Canadian bacon and bacon with marinara sauce and mozzarella cheese. Garlic butter crust topped with Joe Mama’s Signature Mac N Cheese and Applewood smoked bacon. Grilled chicken breast, bacon, cheddar and blue cheeses, finished with buffalo sauce and a dab of ranch. Corned beef, 1000 island, Swiss and mozzarella cheese and Bavarian sauerkraut. Canadian bacon, seared pineapple, Applewood smoked bacon and red onions with marinara sauce & mozzarella cheese. Finished with cilantro. Kids meals served with fries or chips and a pickle. $5.95 Under 12 years only. Bid Kids add $1.95. No split checks on parties 6 or more. Gratuity may be added on checks of parties 8 or more. 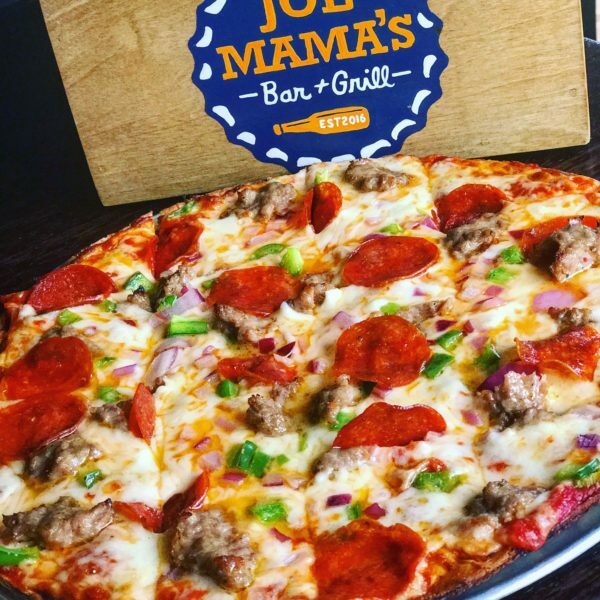 Joe Mama's Bar & Grill located in Colgate, is your new favorite neighborhood bar. Focusing on top notch service and delivering elevated bar food. © 2019 Joe Mama's Bar & Grill. All rights reserved..